This was a fairly emotional moment…tearing one of the few completely stock pieces of The Ghost out…like gutting the heart out of an animal. I take ease in the fact that it will be replaced with a nice milled piece of aluminium with 9 gauges sitting front and center. I am now in the process of tidying up the wiring all the way back to the junction panels to allow for a much tidier behind-dash condition. The long broken speedometer system will be abandoned in favor of a newer VDO pulse sender. All other gauges (other than air) will be routed electrically through a new 15 conductor cable to the rear of the coach to new senders placed all over the engine/transmission/etc. I also will be using this cable to run a few signals for engine/transmission devices (Jake Brakes, Neutral Solenoid, Direct-Drive Lock). 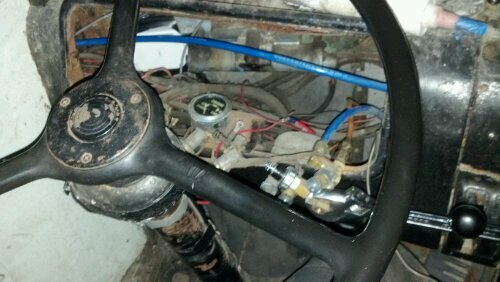 I am also moving over the maxi-air-brake valve (parking/emergency brakes) a little closer to the driver position to allow for less air-lines running behind the dash and to aid in dash removal for service. 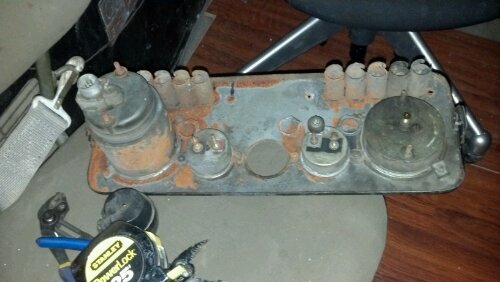 I also removed the very old AM/FM 8-track radio even though it still works. I am tired of looking at that ugly thing hanging out of the dash. While it would be easy to just gut everything and start over…this system is actually fairly decent (including self resetting circuit breakers, large gauge conductors, shrink wrap, and labels). 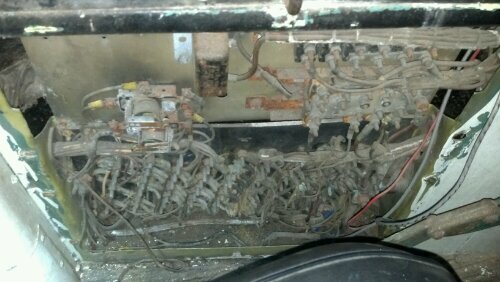 I will slowly transition over to the new wiring but will be keeping many of the old devices that seem reasonable to continue using (horn relay, circuit breakers, bus bars). Doing an all-out replacement is possible however with the expense of copper wiring, it seems silly to gut the old wiring simply to replace it immediately with new. Transition is the name of the game here…just means more complications. Needless to say, the body manual has been invaluable in this process with full size schematics, labels, and circuit descriptions. Not recommended for the faint of heart. 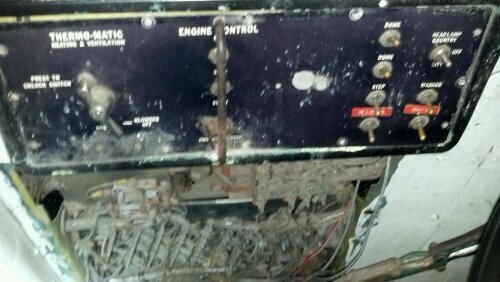 Oddly enough, even in it’s current state, it will still start and run. This entry was posted in Build Update, Electronics by brandon314. Bookmark the permalink.